The following are the latest results contributed by HM Courts Service, for cases sentenced by West Sussex Magistrates’ Court sitting at Worthing from November 29 to December 6, 2018. Christopher Twine, 30, of South Street, Lancing, was fined £300 and must pay £100 compensation, £30 victim surcharge, £300 costs, after being found guilty of using threatening, abusive or insulting words or behaviour or disorderly behaviour with intent, causing harassment, alarm or distress in Lancing on September 17, 2018. He was also given a restraining order. Mark Churcher, 46, of Forest Road, Broadwater, was discharged conditionally for 12 months after being found guilty of assault by beating on March 14, 2018. He was also given a restraining order and must pay £20 victim surcharge, £620 costs. Donna Delaney, 42, of Shadwells Road, Lancing, was fined £252 and must pay £78.75 vehicle excise back duty, £30 victim surcharge, £85 costs, after admitting keeping an unlicensed vehicle in Horsham before January 29, 2018. Nicholas Harrison, 21, of Mendip Crescent, Salvington, was fined £120 and must pay £30 victim surcharge, £85 costs, after admitting drink-driving (130mg of alcohol in 100ml of urine) on the A27 Worthing on June 16, 2018. He was disqualified from driving for 12 months. Jake Ewins, 24, of Northside, Lancing, was fined £321 and must pay £32 victim surcharge, £85 costs, after admitting drink-driving (49mg of alcohol in 100ml of breath) in Sherborne Road, Chichester, on November 14, 2018. He was disqualified from driving for 12 months. Ramona Tutulea-Ciobanu, 31, of Thesiger Road, East Worthing, must pay £85 victim surcharge, £85 costs, after admitting driving while disqualified in Salisbury Road, Worthing, on June 9, 2018. Her driving record was endorsed with six points. She also admitted driving without insurance, no separate penalty. Paul Curtis, 41, of Elm Place, Rustington, was given a community order with Rehabilitation Activity Requirement and must pay £85 victim surcharge, £85 costs, after admitting breaching a non-molestation order by sending three messages in Rustington between November 8 and 11, 2018. Paul Piper, 45, of Sylvan Road, Sompting, was given a community order with Rehabilitation Activity Requirement and fined £100 after admitting failing to provide a specimen of breath for analysis when required in Brighton Road, Lancing, on July 18, 2018. He must pay £85 victim surcharge, £105 costs, and was disqualified from driving for 12 months. Chris Bashford, 40, of West Mansions, Heene Terrace, Worthing, was fined £353 and must pay £35 victim surcharge, £85 costs, after admitting harassment by sending unwanted emails in Worthing between September 30, 2018, and October 6, 2018. He was also given a restraining order. Harry Cranford, 26, of Rusper Road South, Worthing, was given a community order and must carry out 120 hours’ unpaid work after admitting failing to provide a specimen of breath for analysis when required in Worthing on November 16, 2018. He must pay £85 victim surcharge, £85 costs, and was disqualified from driving for 36 months. Daryl Hunt, 23, of Newtimber Avenue, Goring, was given a community order with Rehabilitation Activity Requirement and must pay £85 victim surcharge, £85 costs, after admitting fraud by dishonestly making a false representation, using a credit card belonging to another to make a gain of £943.73 for himself in Goring between June 19, 2018, and July 25, 2018; and fraud by dishonestly making a false representation, withdrawing money from a bank account using a bank card belonging to another, intending to make a gain of £1,543.30 in Goring between August 28, 2018, and September 6, 2018. 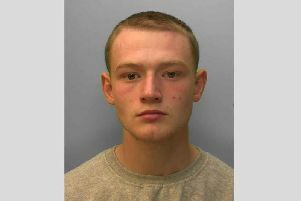 Luke Nayyer, 18, of East Ham Road, Littlehampton, was discharged conditionally for three months after admitting stealing a pedal cycle of unknown value in Angmering on June 15, 2017; and stealing a £200 pedal cycle in Angmering on June 26, 2017. He must pay £200 compensation, £20 victim surcharge. Philip Warren, 30, of Kent Close, Shoreham, was given a community order with Drink Impaired Driver Programme Requirement after admitting drink-driving (121mg of alcohol in 100ml of breath) in the McDonald’s car park, Eastern Avenue, Shoreham, on November 17, 2018. He must pay £85 victim surcharge, £85 costs, and was disqualified from driving for 36 months. Andrew Broadbent, 41, of Ruskin Road, Broadwater, was given a community order with eight-week curfew, electronically monitored, from 8pm to 6am daily after admitting failing to provide a specimen of breath for analysis when required at Worthing Custody Centre on November 2, 2018. He must pay £85 victim surcharge, £85 costs, and was disqualified from driving for six months.